The above info came from atomofish, and was edited by yours truly (contact me). The image came from Amazon.com. After the massive war against the invaders in the original Getter Robo, Getter pilot Ryome Nagare is sent to jail for the murder of the evil Dr. Saotome. However, Saotome rises once again to threaten the Earth with his latest plan, the Shin Dragon. 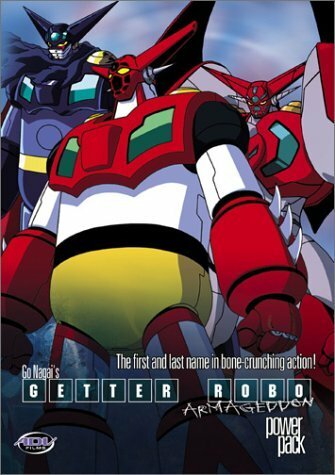 Ryoma once again teams up with the Getter pilots to stop Saotome, however things go horribly wrong when a nuclear warhead aimed at Shin Dragon misfires and ends up wiping out 99% of humanity in the process. Thirteen years after the massive disaster, the remainder of humanity continues to struggle for survival against the Saotome and the deadly invaders. However, out of the ashes rises Shin Getter Robo, piloted by the artificial human Go. He teams up with the Getter team for one final strike against Saotome and the invaders. The above description came from atomofish, and was edited by yours truly (contact me).